C. McILvar Ltd are involved in a wide variety of projects across N.I. and beyond. Each site has different issues which need to be addressed and we specialise in identifying possible constraints and overcoming these constraints to achieve our clients goals. Right from the start, CMcIlvar impressed us with their efficient, professional manner – an approach that not only inspired confidence but generated the results we were looking for. We here at OJQ Architecture have been using C. McIlvar Ltd for some time now ,the companies approach to professionalism and efficiency is second to none, anything we ask of C. McIlvar ltd is carried out no matter how difficult the task. We would find it very difficult to find a chartered planning consultancy that ticks as many boxes as C. McIlvar Ltd does. I have used Carol’s expertise for the past year or so, and find her to be exactly what I expect a Planning Consultant to be. She ‘’knows her stuff’ regarding Planning Policy and has handed out expert help and advice on any of the schemes we have worked on together. She has been able to determine the correct method to employ in order to achieve success with the Planners and, much to my satisfaction, is not afraid to let Planning Officers know when they are wrong in their assessments or if they are overstepping the mark. I have no hesitation in recommending Carol McILvar Ltd as an expert Planning Consultant. She is pleasant to work with, reliable, and loves her work. in the end and it was. We would have no hesitation recommending Carol’s services and her company to others. We have done business with Carol McIlvar for a few years on domestic and commercial projects and found her to be very competent and professional at her job. She knows the planning laws inside out and leaves nothing to chance when preparing a case. We would have no hesitation in recommending her as a planning consultant to anyone and our only regret is not having met up with her sooner. I have worked with Carol on a number of projects over the last few years. I have found her to be a very professional and capable planning agent. On two occasions she has surpassed the expectations of me, a public representative and indeed the applicant having 2 sites passed which seemed impossible. I have no problems in recommending Carols services. I have been practising in a private capacity for last ten years providing architectural planning and project management services. Prior I was employed by one of Northern Ireland’s major multi disciplinary consultants who provided same services to both public and private sectors. During this time I engaged planning consultants to assist in preparation and follow on procedures with local planning authorities. In recent times I have solely engaged the services of C. McILvar Ltd as I have found the firm to be the most professional and up to date company around in dealing with all planning issues. What to do if you need any planning advice….. The team at C.McILvar Ltd are happy to provide initial advice and a fee proposal for any planning related matters. We will always make clear what the prospects of success are and the costs involved before undertaking any fee paid work. As a practice we pride ourselves on giving very candid advice prior to taking on any work for new or existing clients. The majority of our work is securing planning permission for all types of development. Our expertise is wide ranging and you can be sure that if you are dealing with any aspect of the planning system then C. McILvar Ltd has the knowledge and experience to get you to a successful outcome. We have selected a few recent projects that reflect the type and range of our work. In March 2014 C. McILvar Ltd was successful in obtaining planning permission for the approval of a replacement dwelling at Edendoit Road, Pomeroy. This was no ordinary case as the building on site was once a mobile structure and was not permanently attached to the ground. The applicant was refused permission for the same in 2012 after which he employed C. McILvar to take over the case. With a refusal on the site the chances of obtaining approval where slim. The Department refused the previous application on the basis that as the building to be replaced was not a permanent structure it failed to meet the requirements of CTY 3 ‘Replacement Dwellings’. C. McILvar Ltd decided to approach the tricky scenario with a number of applications with the end result being approval for a dwelling. To do so Carol had to install confidence in the young applicant. Carol explained that whilst her suggested methods where long winded and uncertain she believed she could obtain the desired result, a family home for the applicant and his fiancé. After the submission of Certificate of Lawfulness, followed by an outline application the couple have finally received planning permission for a replacement dwelling on site of the building pictured above. Noteworthy the applicant’s where issued with an enforcement warning letter in the middle of the process which needed addressed! See couples testimony in clients section above. Contact Us to find out more about the methodology employed. 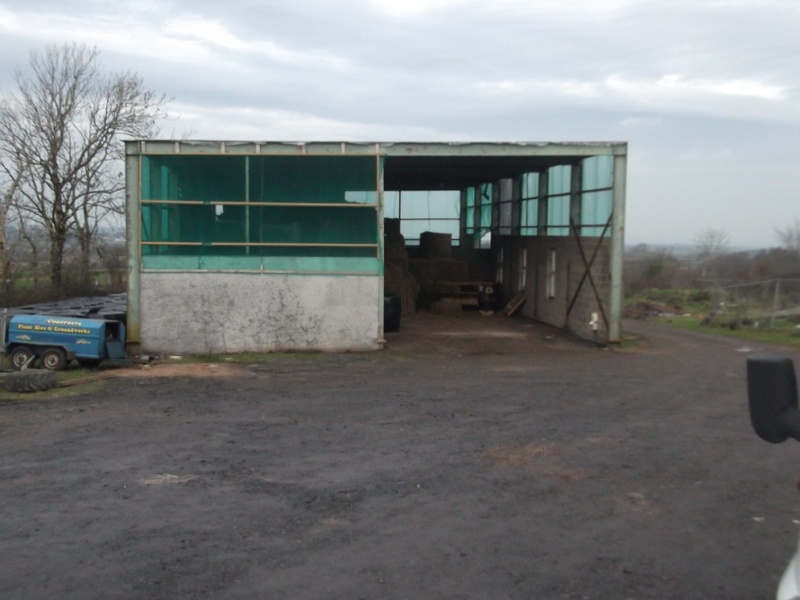 After two failed planning applications and numerous enforcement letters from The Planning Department C.McILvar Ltd recently was granted approval for the retention of an unlawful agricultural shed built in 2010 at Liscall Road, Garvagh. 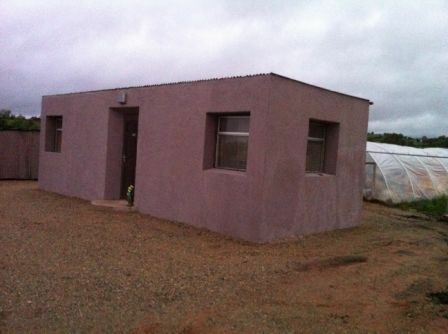 After years of being ordered by the enforcement officers to demolish the near complete shed measuring 320 sq m constructed of steel and block, the applicant was delighted to learn that C.McILvar Ltd had been successful at Planning Appeals; he could keep his building. The enforcement notice was quashed and the case closed after years of the applicant battling with the local planning department and enforcement team. Contact C. McILvar Ltd to learn more about enforcement issues such as this. C. McILvar Ltd was successful in obtaining approval for a replacement dwelling at in January 2014 working as consultants alongside McGurk’s Architects, Magherafelt. C.McILvar Ltd was involved from the outset, assisting, arguning & advising McGurk’s through the lengthy application process. The subject application sought permission to replace a disused dog kennel building, wedged within a number of farm sheds with a offsite replacement dwelling in a nearby field. The Planning Department where adamant that the building to be replaced had not previously been used for residential purposes. The application was recommended to Magherafelt council on two occasions during 2013 as a refusal. Eventually approval was granted after C.McILvar Ltd successfully argued that although building was built around on all sides with no evidence of a chimney or fireplace; a few essential characteristics of a dwelling were evident inside i.e. domestic windows. After 12 months of debating the merits of the case with all the different levels of planning officers the head planning official in Omagh Area Planning Office agreed that the building had once perhaps been a house and in the round complied with Policy CTY 3 of PPS 21 ‘Replacement Dwellings’. The approval permitted the applicant to retain the existing building and construct an offsite replacement dwelling in an adjacent field. The approved decision notice was received by C. McILvar Ltd in January 2014. 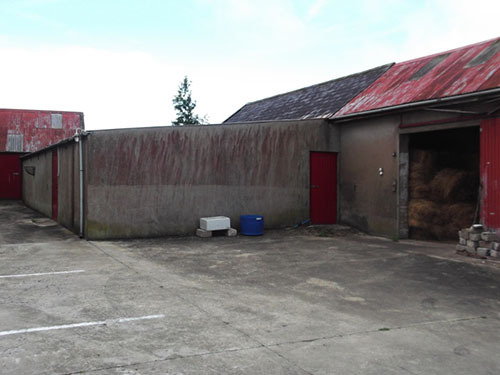 Planning permission was achieved by C. McILvar in November 2012 for conversion and renovation of 3 disused farm buildings and yard for use as a Fun Farm Activity Centre to be run in conjunction with applicants active farm holding. Consent was granted within six months of submission of application for Fun Farm Diversification Project at 574 Glenshane Road, Feeny. 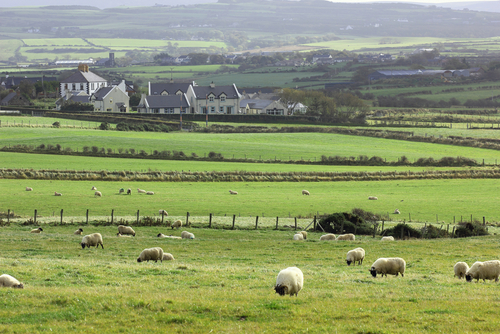 It was successfully argued that the proposal complied with the requirements of CTY 12 of PPS 21 ‘Farm Diversification’. The applicant applied for a farm diversification grant and was successful in being awarded substantial funding towards the construction works. 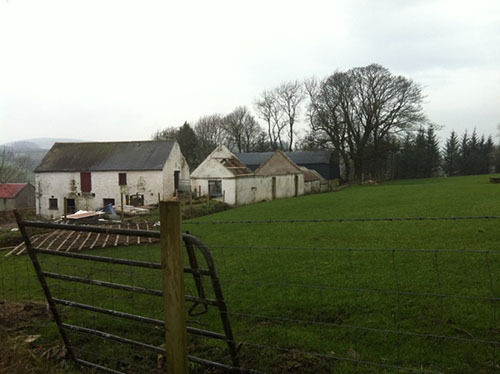 The above photograph illustrates the disused farm buildings and farm yard which was awarded permission as a viable farm diversification scheme. 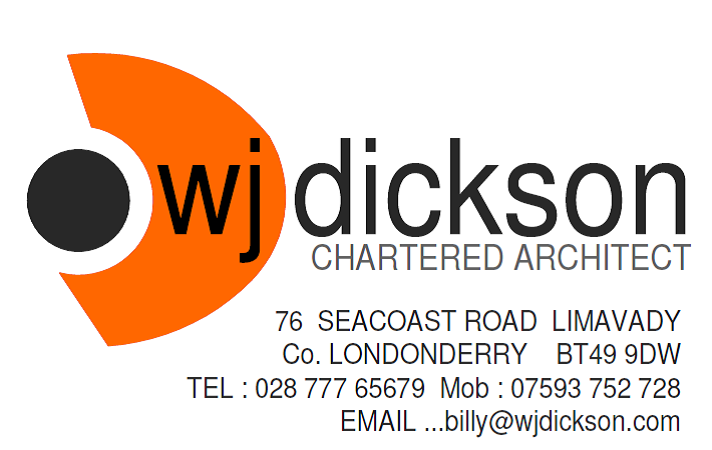 Work is ongoing and C. McILvar Ltd has recently achieved building control approval from Derry City Council. With construction work nearing completion it is hoped the Fun Farm Centre will be open to the public early 2015. Sunshine seems to be a rare commodity in Northern Ireland, but there is growing local interest in harnessing solar power. Technological advancements in PV (photovoltaic) mean that it is now more viable and a serious option at a commercial scale. Domestic scale solar panels usually do not require planning permission, however for larger schemes or those which do not fall within permitted development it is a necessity. C.McILvar Ltd has also recently secured planning permission for A Frame solar panels on roof of Kenny Bradley’s Spar Shop, Magherafelt; again on behalf of Solmatix Renewables. 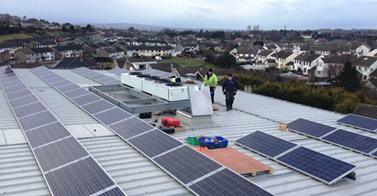 The above photograph depicts Solmatix engineers at work installing the A Frame panels on shop roof in Magherafelt. We have recently also secured planning permission on behalf of Solmatix Renewables granted for the first phase of a solar farm at Chestnut Holiday Park, Kilkeel, Co. Down. We have seen significant new interest in securing consent on local farms etc and we expect that this will continue apace because of the attractive Government incentives. Contact us to find out more about solar panels and other renewable energy options available to you.